Saint Patrick is the Patron of Ireland. Saint Patrick was born around the year 385 A.D. in Kilpatrick, Scotland. Saint Patrick's parents were Calpumius and Conchessa. They were both Romans that lived in Britain and were in charge of the colonies. At the age of fourteen Saint Patrick was captured during a party when the colony he lived in was raided and he was taken to Ireland. He worked as a slave to herd and tend to the sheep. During his time in Ireland he learned the language there and the practices of the people that led him. When he was in Ireland he had turned to God in prayer. Saint Patrick escaped when he was twenty. He did this because he had a dream in which God had told him to leave Ireland by going to the coast. When he was there he had found some sailors who took him back to Britain. He was then reunited with his family. After, he had another dream in which all the people of Ireland were calling out to him. Saint Patrick then began studying for the priest hood. Saint Germanus, the bishop of Auxerre, ordained St. Patrick. Saint Patrick was later ordained as a bishop and was sent to take the Gospel to Ireland. On March 25th 433 B.C. he arrived in Slane, Ireland. A legend said that he met a Chieftain from one of the tribes, who tried to kill Saint Patrick. 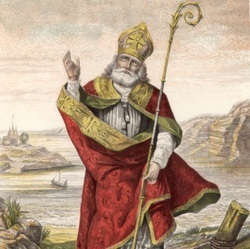 Then, Saint Patrick converted the Chieftain to Christianity, after the Chieftain was not able to move his arm until he became friendlier with Saint Patrick. After that, Saint Patrick began preaching in Ireland and converting many. The disciples helped him preach and convert many people and began building churches all over Ireland. He converted Kings, their families and entire Kingdoms to Christianity, when they heard Saint Patrick’s message. Saint Patrick had many disciples; they were Beningnus, Auxilius, Iserninus, and also Fiaac. All these disciples where later canonized as well. Saint Patrick had preached and also converted all of Ireland for at least forty years. He had worked many miracles and also wrote of this love for God in confessions. After living many years in poverty, travelling and enduring much suffering he died on March 17th, 461 B.C. He died in Saul, Ireland; the same place where he had built his first church. Saint Patrick's feast day is March 17.